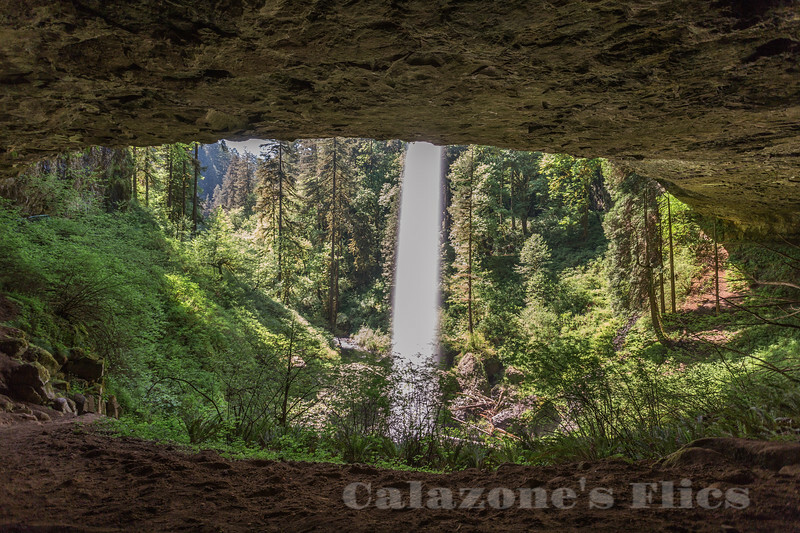 Silver Falls State Park is a state park in the U.S. state of Oregon, located near Silverton, about 20 miles (32 km) east-southeast of Salem. It is the largest state park in Oregon with an area of more than 9,000 acres (36 km2), and it includes more than 24 miles (39 km) of walking trails, 14 miles (23 km) of horse trails, and a 4-mile (6.4 km) bike path. Its 8.7-mile (14.0 km) Canyon Trail/Trail of Ten Falls runs along the banks of Silver Creek and by ten waterfalls, from which the park received its name. Four of the ten falls have an amphitheater-like surrounding that allows the trail to pass behind the flow of the falls. The Silver Falls State Park Concession Building Area and the Silver Creek Youth Camp-Silver Falls State Park are separately listed on the U.S. National Register of Historic Places. The park's most visited waterfall is South Falls, a 177-foot (54 m) cascade. Remote Double Falls, however, is listed as the highest waterfall in the park, plunging 178 feet (54 m) in a small tributary side canyon deep within the Silver Creek Canyon. Fantastic PoV on this waterfall !